I propose that philosophy in its most general sense can be understood as “The human endeavor to understand the nature and functioning of reality.” Human beings are thinking animals that use ideas to guide action. 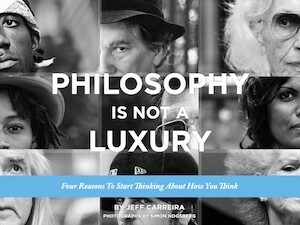 Philosophy is the human effort to create ideas that accurately describe the way things are so that we can use those ideas as a basis for acting. In the development of Western philosophy there have been two approaches to the endeavor of philosophy that persist to this very day. These two ways of going about philosophy are sometimes known as Rationalism and Empiricism and in fact these distinctions existed long before the terms were created to describe them. In short, Rationalistic thinkers put their faith in reason. They mistrust sense experience that is not mitigated by reason because they recognize that our senses can deceive us about reality. For this reason they believe that ultimate truth lies in the realm of ideas and reason. Empiricists, on the other hand, put their faith in our sense experience of the world. They mistrust ideas that are not grounded in sense experience because they see that ideas on their own easily fly into fantasy. Science as we know it today can be seen as a special case of Empiricism and Spirituality as a special case of Rationalism. Science is an Empirical pursuit that makes use of the scientific method for determining the truth from our sense experience and has as its aim a complete understanding of the material world. The scientific method involves hypothesizing a theory and then testing the theory through experimentation. Only information that is obtained in this way is truly scientific. If a theory is not testable it is not considered scientific. Spirituality is a Rationalistic pursuit that maintains the validity of “revealed truth” and that has as its aim the moral transformation of the individual to act in accordance with revealed truth. In traditional religious terms revealed truth was seen as the word of God – for instance as recorded in the Bible. In our own time revealed truth has come to be interpreted as personal “spiritual” experience which seems to “reveal” something of the ultimate nature of things to the experiencer. These revealed truths are generally seen as being self-evident and therefore no experimental testing is required to “prove” them. Early in human understanding the distinction between philosophy, science, and spirituality was not clear and all three were intermingled. With the age of Enlightenment these distinctions became clearer. And over the centuries Religion has been largely usurped by Science as the dominant world view in the Western World. Reading the book ‘cutting through spiritual materialism’ this week, I found that theories that are used today, actually go back the the Buddha: The three Lords. The Lord or Form (control nature, our fears and desires, with technological products); Lord of Speech (structures in consciousness) and Lord of Mind (that we use reality to create a sense of ‘I’). Chopra: they are forms (qualia) of consciousness within consciousness. Fundamental truth is a possibility field, it is very different from perceptual reality which is species specific, which cannot be real. The field of fundamental truth experiences itself through us. Our brain is an observation deck for the universe. Our awareness shows us that there is a universe. After a long history of religion and science usually at loggerheads, where scientists have contended that belief and existence of God cannot be proven and therefore invalid, humanity seems to have (finally) evolved to a more holistic recognition of the unity of the two aspects of our human psyche. Without this synthesis, truth would be skewed and incomplete, it would seem. The validity of spirituality in our times in my view rests on the recognition that the human rational mind deals with material truths and existence and spirituality when doing its work invests humanity with values that help to maintain our collective conscience that should act to keep in check the excesses of science and technology. Science and the rational mind act in this way as well to keep metaphysics in check to prevent it from becoming too extravagant and overweening in its zeal. Listening again to Chopra, I saw I made a mistake. He doesn’t say there is no green. He says nobody knows how the brain produces the experience of green, which of course is very different. I just read from him: Today, as science probes into the nature of ultimate reality, pinning its hopes on a unified field theory with discoveries like the Higgs particle, I am awestruck by the fact that the teachings of Vedanta remain ahead of the most modern theories on the nature of the cosmos and also of our awareness of it. Science, being based on a physicalist ontology struggles to explain how physical matter could generate the experience of consciousness. This has been called the “hard problem” by neuroscience as there is not even a theory for it. Krishna solves the problem in one statement to Arjuna in the Bhagwad Gita: “I am the field and the knower of the field.” What a revelation! Consciousness is the fundamental ground of existence. It is both the observer and the observed. In this deeper understanding, the universe is an integrated wholeness that differentiates into space, time, energy and matter on the objective side, and the subjective world of thoughts, sensory experiences, feelings, creativity, insight, love, joy and compassion on the other side. Spirituality was a response to living in a very unknown universe. When explanations are required to make sense of the world, but none are available, then the human mind invents explanations to justify one’s actions or orders. But what explanations are left? Basically, why there is something rather than nothing, and how specifically did life arise. These are the realms where the most informed people hold on to their spirituality. Like the “god of the gaps”, this spirituality of the gaps is shrinking to the point of irrelevance. That is a ultimately a good thing as we need to know actual truths to survive, not “revealed truths,” aka “stories we make up,” which give a dangerously false sense of security. Hi Ed, that is totally how I used to think. But that is how you miss the best part of being alive. There are so many people who have great experiences that point to another quality of spirituality.. You might change your mind listening to video’s or reading blogs of Andrew Cohen (http://bigthink.com/the-evolution-of-enlightenment/daring-to-bear-witness). As a mathematician, I was very impacted when I read Brian Swimm (mathematician and cosmologist) speaking about how the univers is discovering itself through mathematics that emerge in the complexity of the human brain. Einstein was also veryconnected to the fist cause, the revealved truth. He often used the word God but not in a dogmatic way. The more I evolve in spirituality, which means the more I recognize that spirit is first, the more I am in touch with science. I reach a point in my life where I realize that real science could only exist in a spiritual context. I can’t be in touch with science outside of a spiritual context because outside of this context, science becomes dry and rigid and this is not its nature. To Liesbeth and Christophe and Ed , I am completely with you in what you say about the Vedanta and its awesome awareness of reality, Liesbeth. And I like very much what you say Christophe about that real science is happening only in a spiritual context. From both of your remarkable statements I see a connection to ‘The cogito ergo sum’ of Descartes. What I like very much of what Descartes is saying is that when you leave out everything you are not sure of, the only thing what remains is the fact that you are. To me this touches directly on what you are saying Liesbeth about the Vedanta and ultimate reality, and what I like about this also is that it shows the limitation of the sensory experience, Christophe. Similarly to Deepak Chopra is saying empirical truth seekers do not know anything about reality outside our sensory experience. It is our brain which makes, or makes up Ed, on basis of the information of our senses, this image, empirical truth seekers call reality, where reality is split in time and space. To me there is also an other way to find out about the nature of reality and this is were you are speaking about, Liesbeth, described by the Advaita Vedanta. This is completely in contrast with reality based on the senses. Interestingly enough we could describe meditation as discarding sensory input or drawing no conclusions on the basis of their input. Andrew Cohen is speaking about ‘leaving everything as it is’ and ‘drawing no conclusions on the appearance of thought’. And as Advaita Vedanta knows already for thousands of years, that is how we realize Ultimate Reality, where there is no time and no space. There is only One. Quantum Mechanics, one of the most advanced theories of empirical truth seeking, developed a formula for the speed of an object and the space travelled during a specific time. If we apply this formula on a Photon travelling at the speed of light, time travelled is zero and the space travelled is also zero. Peter Russell in a video on youtube, The Primacy of Consciousness Full Version, explanes this, and to him this means that from the perspective of a photon there is no time and no space. In Quantum Mechanics there are many calculations who point to the undividedness of reality. It is only a context outside Emprical Science who draws the conclusions, that these calculations are pointing to non-duality. To me it shows that both empirical thruth seeking and spirituality are needed to make perfect sense of our lives. I recognize myself that I am deeply invested in a dualistic worldvieuw, discovering spirituality falling deeper into Ultimate Reality has liberated me and I am taking care that I am never going back to this rigid and painful denial of most of our experience. Empirical truth finding cannot be discarded, but to me, similar like you are saying Christophe, Spirit Comes First. Great to read you Sumadi. I must say I am not following any Advaita or anything, I was just blown away by the talk of Chopra. .. I heard so often the story of the Buddha holding the flower and now hearing the meaning of that, I loved it so much. Since I follow this blog, I have looked in so many philosophers and the question of what we experience and what is really there got more and more confusing. At the moment I am looking to many different colored trees around me and the idea that consciousness somehow produces these images in my brain while it is not actually there and that we do not know where any of (my) ideas are stored, that we do not know what memory is, that it is not in the brain, that there is no knowledge stored anywhere in the brain… I just completely lost it. What the heck is happening. I think Chopra proves enough that he cares a lot about what is happening in the world, he was very present and helpful at the Occupy movement and totally supporting Andrew. When I met Andrew I was just as blown away when he said that ‘we can never know God with our mind’ as I am now hearing Chopra say dat we actually do not know anything. Suddenly something touches and everything you thought you knew just falls away and the only thing one can do is find out more, and more. It is actually the scientific prove of what evolutionary teachings are saying. I could really experience so deeply everything moving, changing, evolving, not only consciousness but nature itself. It all comes together in the things he said. It is not ‘we’ of ‘them’ it is what we are all interested in. I just listened to the Peter Russell, The Primacy of Consciousness http://youtu.be/c1vCm9M6YA8. They totally talk about the same thing…Russell from philosophical background and Chopra from Buddhist/advaita background, but it is the same, including the (colorless) photons. I am saw it many times every time it blows my mind. Thanks for the respectful reply Liesbeth. I disagree, but encourage you to keep seeking. As I say on my site, Life Makes Sense. Hi Ed, That’s too intruiging a comment (Life Makes Sense) to leave it at that. Can you go into a bit more, maybe a few paragraphs if possible? What is Empirical and Rational Truth? When something is self evident it can be readily agreed upon. That we have such a large variety of religious beliefs available makes the idea of any belief system being at any part self evident is contrary.